This was a bit of a special project of mine. Not particularly by it's meaning, but it's purpose. 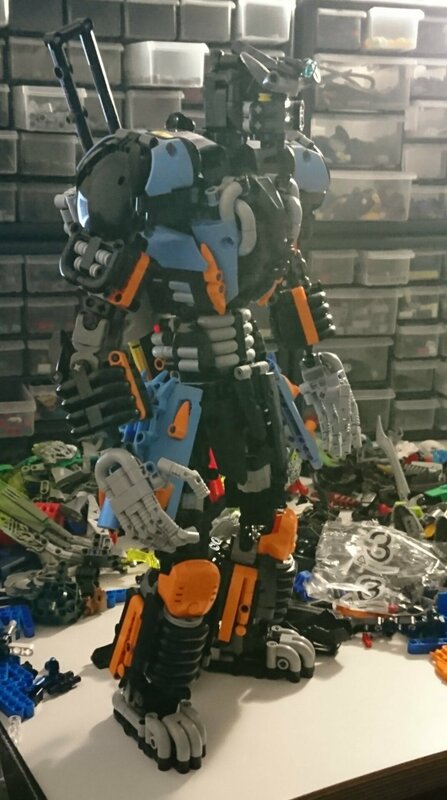 This started off as an experimental build to create a very posable yet sturdy frame based on that of the Witch Doctor set from Hero Factory. That particular set was strong, but lacked in leg posability, so the primary objective was to implement thigh- and bicep swivels into the design. Starting from ground up, I just kept going with the frame bit by bit. The secondary objective was to emphasize technic in the build, so it would have a more smooth and mecha/gundam-like appearance. The initial leg designs started to give off a warrior vibe and the samurai-esque end result became rather inevitable after I added the skirt armor early on. During the process I ended up watching some Shadiversity videos on weaponry. That inspired me to give the moc a giant sword that would fit into a Shadiversity's version of a scabbard, also known as a shabbard. That in turn made me invest into the moc's posability, so that it can actually reach the sword. Designing the hands wasn't particularly difficult, as I already had ideas for improving an earlier hand design from Monarth the Dream Warden. It took a few tries, but I nailed the structure pretty quickly. It took a bricklink order to correct the hand colors and get extra joints for the fingers, so that was a first for me to order specifically to complete a moc. Either way, I'm very happy with how this came out. Due to the size he's slightly wobbly, but otherwise very pleasant to pose. I need to tone down a bit after this one. Next moc will be something smaller. This guys texturing is on point. For a laser sword the red part is as much cutting edge as it can get. Consider it a very, VERY long hatchet. Also, there were some limitations in the design of the sword, because it had to fit the scabbard on the back. The blade can't under any circumstance be wider than 1 stud length. While implementing a 'tip' would be possible, it'd be pointless in terms of context (unintentional pun), and very frustrating and brittle to implement. Wow this thing looks huge, how tall is it? Yeah, getting hands the "right size" is a bit tricky given lego's measurements by studs. Even if I removed one finger to make the hand smaller, then it'd be too small. In this instance the larger hands were the better choice. 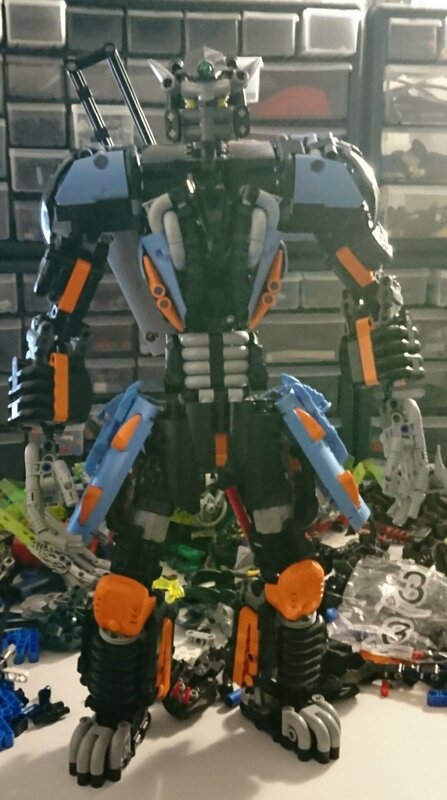 This moc is really impressive, though would it be possible to get a picture of it with a neutral stance? Super robot giant samurai is awesome! I don't have anything like that edited, but here's a couple I took with my phone soon after completing it. I like it, it looks really good! The grey, black, light blue, and orange are all good colors. Yo my man, my bratan this looks cool. I love how it's made out of technic and system pieces, I mean is this even lego? It looks freaking amazing, great job. It might have some blocky areas, but this is an awesome Japanese styled mecha!